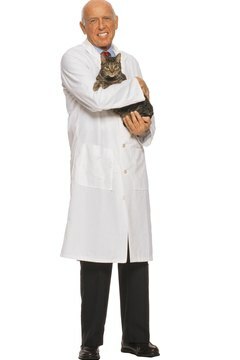 "I know I'm in good hands with my veterinary surgeon." Getting old ain't for sissies, whether human or feline. Older cats often develop hyperthyroidism, which throws their whole system out of whack. If your cat is diagnosed with this endocrine disorder, you might opt for surgical removal of Kitty's thyroid glands, or a thyroidectomy. It usually solves the problem. When a cat's thyroid glands produce too much thyroid hormone, the result is hyperthyroidism. It usually occurs in conjunction with a benign tumor on the glands. Since the thyroid affects the cat's metabolism in so many ways, symptoms vary widely. However, if your cat always appears hungry but loses weight, drinks and urinates a lot more, looks unkempt and starts acting "hyper," suspect hyperthyroidism. Signs of hyperthyroidism you can't see include high blood pressure, which affects his kidneys, eyes and heart. Your vet diagnoses hyperthyroidism by checking Kitty's neck for enlarged glands, along with blood tests for thyroid levels. Before the surgery, your cat's thyroid levels are brought into the normal range through drug therapy. He might also undergo a scan to see whether one or both of the thyroid glands require removal. If thyroid tissue has moved to other areas of his body, which isn't uncommon, a thyroidectomy isn't the way to go. During the surgery, the vet removes affected thyroid tissue. One plus is that this operation can usually be done by your regular vet. According to Gulf Coast Veterinary Specialists, approximately 9 percent of cats die due to complications of surgery. Although that means your cat has a 91 percent chance of a good recovery, it's something to consider. There's also a risk that the surgery could damage the cat's parathyroid glands, located near the thyroid glands. These glands maintain the cat's blood calcium levels. If any abnormal thyroid tissue isn't removed, your cat should start showing hyperthyroid symptoms within six months or longer. Compared to the other hyperthyroid treatments, it's relatively expensive. Not all cats are candidates for thyroid surgery. Since hyperthyroidism affects elderly cats, the anesthesia required for the operation might be too risky for frail felines. Your vet might prescribe methimazole, marketed under the brand name Tapazole, to regulate Kitty's thyroid. While the pills are inexpensive, you'll have to give them to him twice daily for the rest of his life. He'll also have to go to the vet regularly to check the thyroid levels in his blood, so dosage might need adjustment. The other alternative to thyroidectomy is treatment with radioactive iodine. This cures the condition, but you might have to travel to find a veterinary facility performing the procedure. 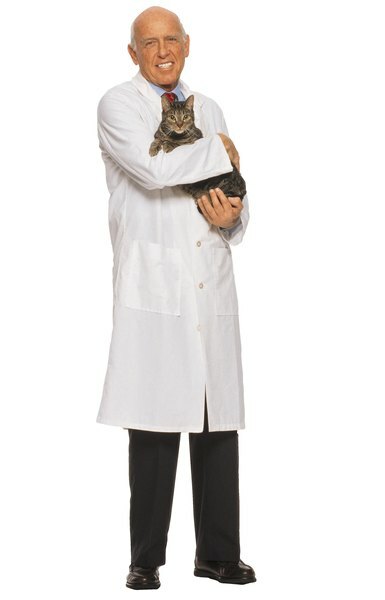 Radioactive iodine is injected into your cat like any shot, but he must stay at the facility for a number of days until he's no longer radioactive. You can't see him during this period. Because veterinary technicians can offer only minimal care during his quarantine, this might not be an option if your cat requires regular medication for other health issues. Do Tomcats Look for Female Cats?